The wind, rain and sun do not affect all sides of trees equally. This creates patterns on the trees’ bark that we can use to find direction. There are a surprising number of methods of finding direction by studying tree bark. But many of them focus on the organisms growing on the surface of the bark, like mosses or lichens, not the bark itself. 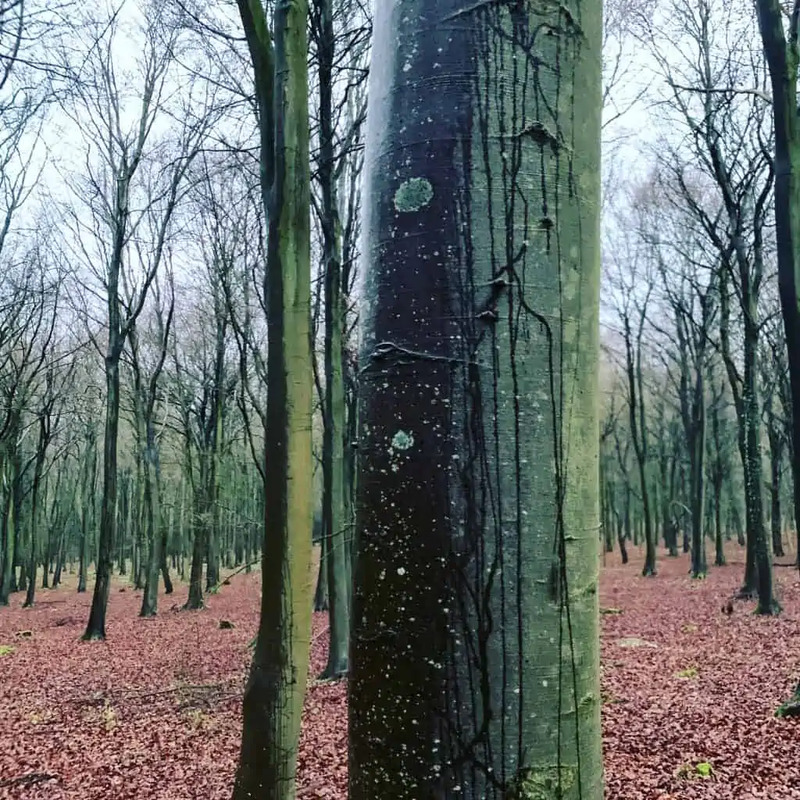 Instead of memorising a list of exactly how each species of tree’s bark looks on their north, east, south and west sides, it is better to look for these patterns each time you head into a new wood. Every time you have got your bearings, perhaps from the sun, glance at each side of the trees around you. 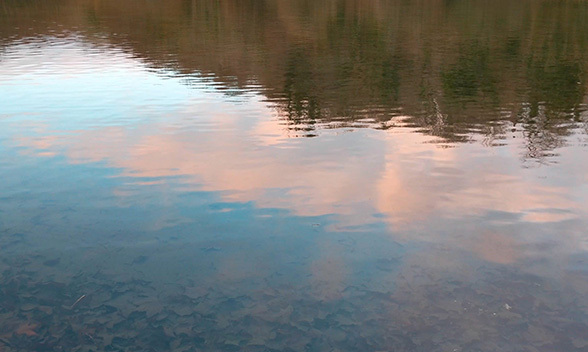 There will be asymmetries in what you see and in these lie clues. Keep practising this habit and soon you will be ready to use those patterns to find direction. There is one nice short-term method we can use after strong winds and heavy rain. All we have to do is notice which side of trees has been ‘painted’ by recent rain-bearing winds and we will have a compass that can last for many hours. Have a look at the photo at the top. There was a gale overnight that brought rain in from the west – notice how all the trees have been ‘painted’ only on one side, in this instance their western sides. We can also use snow on one side of trees to find direction, but that is of course more seasonal. The bark on the north side of a tree is often darker, but that is not true of all species or woods, which is why it is a good idea to ‘reset’ this compass frequently. Many of nature’s clues are easier to find and more reliable in a rural environment, but challenging to find or use in towns and cities. Tree bark is a nice exception to this rule. 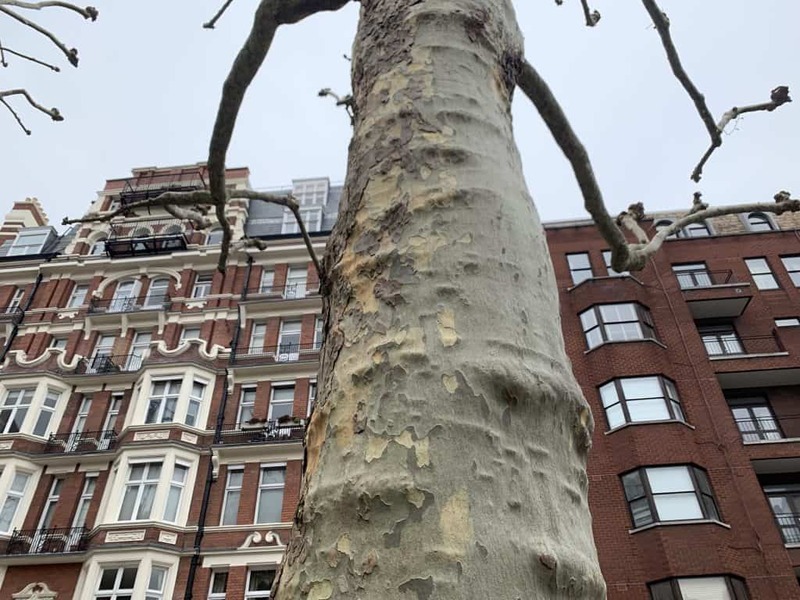 The London Plane tree (Platanus hispanica) has been widely planted in cities all over the temperate world. It is an urban favourite thanks to its ability to tolerate pollution and disturbance to the soil around its roots. 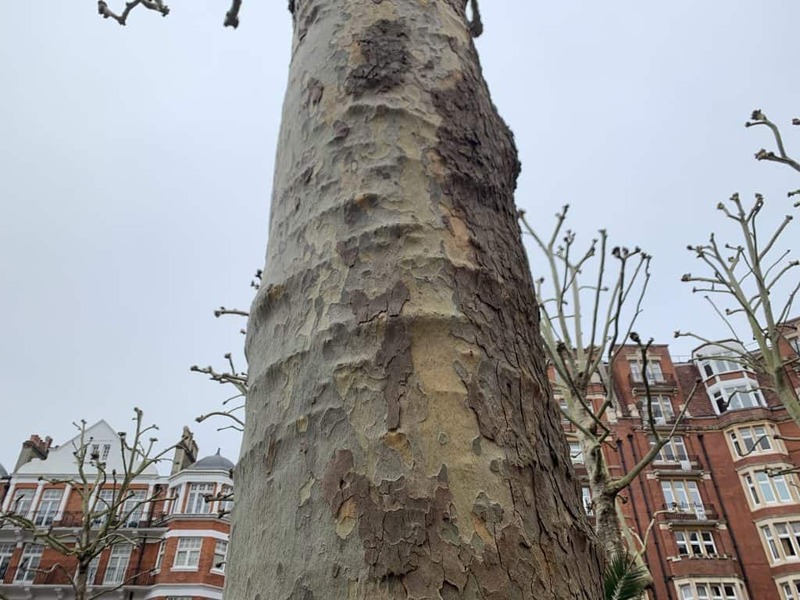 Most trees struggle with the compaction to their soil that roads and pavements bring, but not the London Plane. 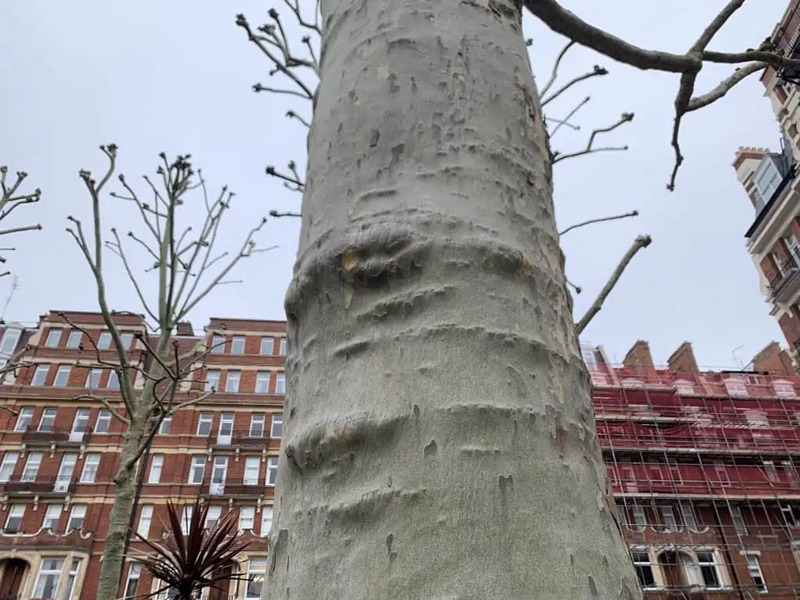 This tree tolerates pollution so well because it sheds its bark in small plates, regrowing new plates that have a lighter colour. This gives the tree’s trunk a mottled appearance that makes it very easy to recognise. It is arguably the the easiest tree to recognise from its bark alone. But it doesn’t shed bark equally on all sides, it sheds more on its well-lit southern side. 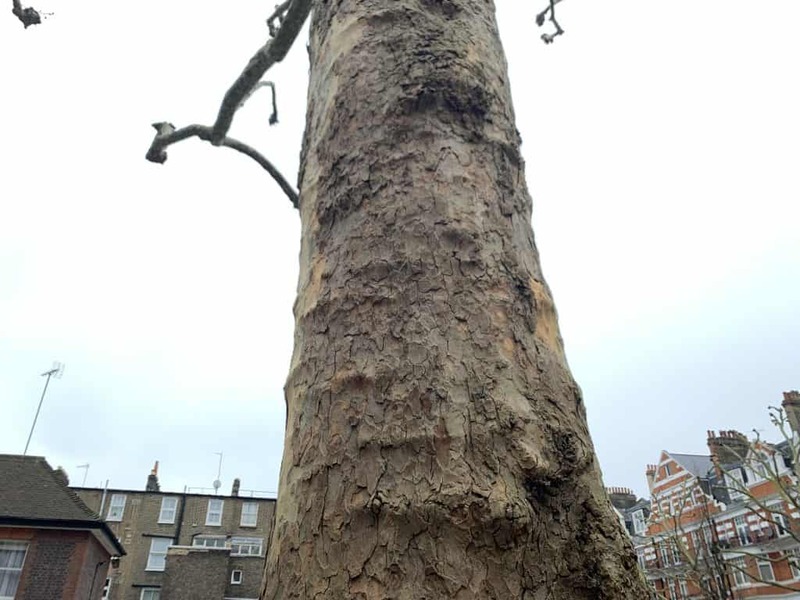 Compare the images below of the same London Plane tree from each perspective – North, East, South and West. I have also written about other ways we can use trees as a compass in my books.